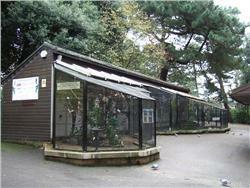 Bournemouth Aviary has existed on Pine Walk in the Lower Gardens for more than 50 years. Pine Walk is right next to the Westover Road. The public can visit the Aviary at any time of day, any day of the year, and there is no admission charge. 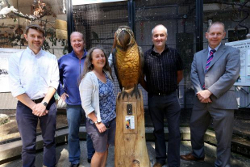 The Aviary was originally maintained by Bournemouth Council, but it is now run entirely by volunteers. We are currently working with the Council on plans to build a new Aviary, so we are currently raising enough money to build it. Of course, we also need money to continue looking after the birds and maintaining the current building. Our target is £200,000. By the Summer of 2018, we have already collected nearly £100,000. There are two different ways you can make a donation (no matter how small), you can read more about them on this page . Most of our birds are rescued, or have been born at our Aviary. We do our best to provide them with a safe and interesting living environment, healthy food, responsible care and an opportunity to live long and happy lives. Visitors often ask our Aviary Volunteers to identify a bird that has caught their attention. The Birds section will help you identify a species if we haven't been able to help you. Even if you already know the identity of a particular bird, this section will show you some pictures of the species and provide you with more information. 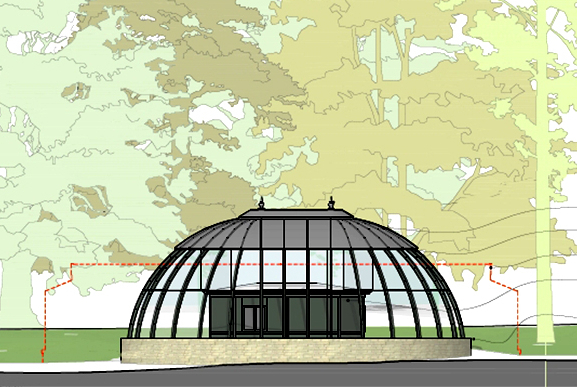 Architects impression of the new aviary. Polly the talking wooden parrot is collecting donations for our Aviary.